2013 Allen & Ginter Endangered Animals "polar bear in a snowstorm"
Yup - I pulled absolutely nothing in all my packs. Pretty disappointing. 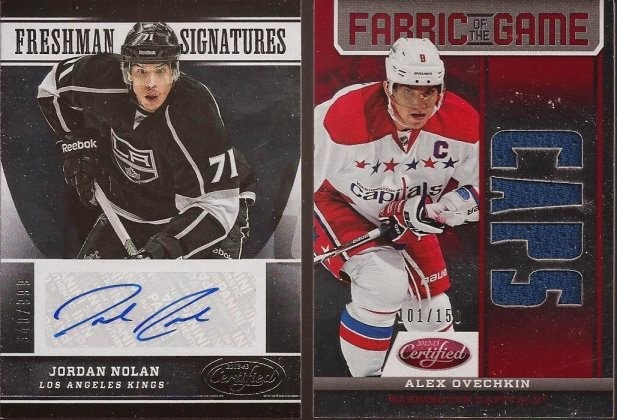 I was going to get a few packs of '14 GQ, but then they started traditional pack war rounds. For those unaware, all who participate buy a specific pack. The man in charge calls out a specific card option (tallest player, youngest, lowest number card, etc...) and then you all open to find what you have. Whoever wins the round wins all the packs, hits included. I figured what the hell. 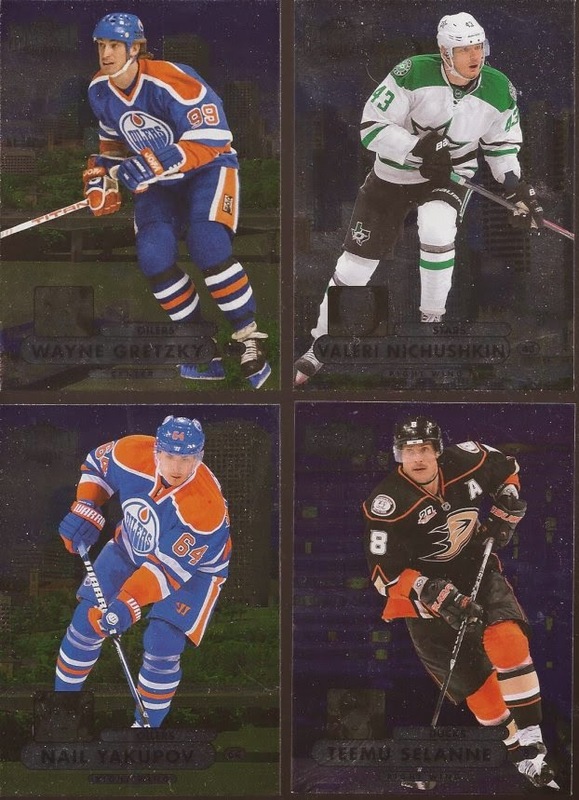 First round was Fleer Showcase hockey. The winning card - lightest player. I pull a Ryan Nugent-Hopkins. Winner! No hits, but I did score these nice Metal Universe inserts. I pulled the Gretzky, but I did snag the Yakapov from someone. So one for one for me. Next round was 2014 series 1 jumbos. That call - youngest player. I pulled Jurickson Profar to pull out the win in round two. If I didn't feel guilty in the hockey round, I felt horrible in this one. That Sundberg buy back was in my pack. The Brett is a black framed rookie reprint numbered to 199. The Cabrera is gold, numbered to 99. But that wasn't all. A Rickey Nolasco auto, plus that Strasburg jersey were pulled by other people and I had to take them from the pack openers. To top things off, when I got home and sorted the seven jumbo packs I won, I found this amongst the cards. 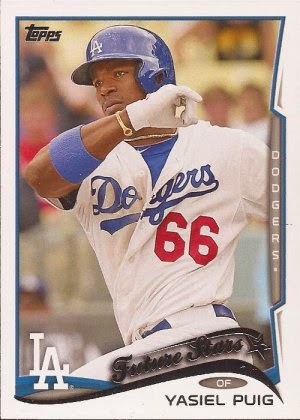 That would be a Puig SP. So instead of buying 4 packs of GQ for $20, I ended up with 13 packs of Showcase and Topps Jumbo ($130 bucks worth of packs). I decided to stop there before everyone hated me. And then they go and sucker me in for one more round - Panini Certified hockey. Lowest number card. One of the kids at the end of the case calls out "three". I reply "three". And that's a tie. So Jeff behind the counter asked for the highest card in the pack. The kid had 132. I had 167. Four more packs coming to me. And my spoils? That Nolan auto is card #167 I pulled, so I didn't have to give it up. My buddy pulled that Ovech numbered to 150. I also "stole" that Strasberg jersey from his jumbo pack. That was it - I was leaving before I was killed. End total - $30 spent. $170 in packs won. I think I did ok.
You got me on that "polar bear in a snowstorm" bit. I clicked on the picture, because I thought my CPU was loading the images. Oye. Well played. Congrats on the big wins at the Pack Wars! Lot of Dodger goodness there, sir. I'm surprised your tires weren't slashed in the parking lot. Are you allowed to come back? I would bring friends next time.